SpaceX has made history again, this time by sending the first-ever recycled cargo ship to the International Space Station. This launch brings the aerospace company one step closer to making flights to space more affordable with reused rockets and capsules. A Falcon 9 rocket launched the recycled Dragon capsule at 5:07 p.m. local time Saturday from the Kennedy Space Center in Cape Canaveral, Florida. Shortly after the first-stage booster launched the Dragon into orbit, it fell away from the capsule,flipped around, fired its engines and landed safely at the Cape Canaveral Air Force Station, according to Florida Today. As ABC News pointed out,used rockets are now returned for a vertical touchdown as part of SpaceXs efforts to lower the cost of flights. The booster launched Saturday likely will be used again. The Dragon made its first trip to space in 2014, delivering food and supplies to the ISS, according to science news site Phys.org. It was refurbished after landing in the Pacific Ocean intact. The SpaceX Falcon 9 rocket, with the recycled Dragon spacecraft onboard, launches from the Kennedy Space Center on June 3 in Cape Canaveral, Florida. Saturdays refurbished capsule will deliver6,000 pounds of supplies to the ISS, including mice and flies to be used for research, a roll-up solar panel, food and a neutron star detector, according to NBC News. The flight had been delayed twice due to thunderstorms. 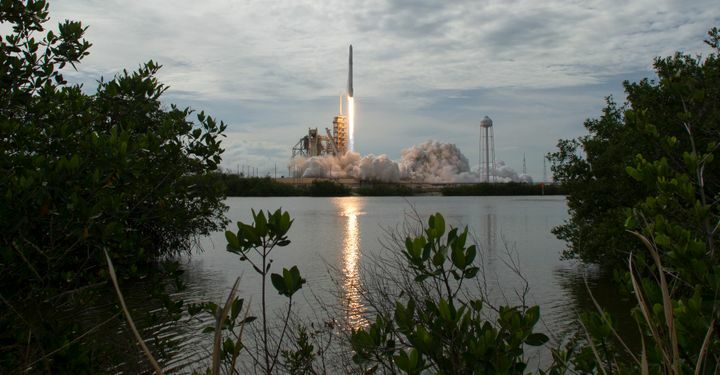 Its a pre-flown Dragon, and that is a pretty big deal too, Hans Koenigsmann, SpaceXs vice president of flight reliability, told Florida Today. That lines up well with our quest to reuse [vehicles] and reusability, and overall in the long-term lowering the cost of access to space. The reused Dragon is expected to reach the orbiting lab on Monday. It will be the first returning craft since NASAs now-retired shuttles. SpaceX celebrated another breakthrough about two months ago when it launched the first recycled orbital rocket, a Falcon 9, from the Kennedy Space Center and successfully landed it on an ocean platform named Of Course I Still Love You.